Use this easy-to-follow recipe to make pepperoni from scratch. 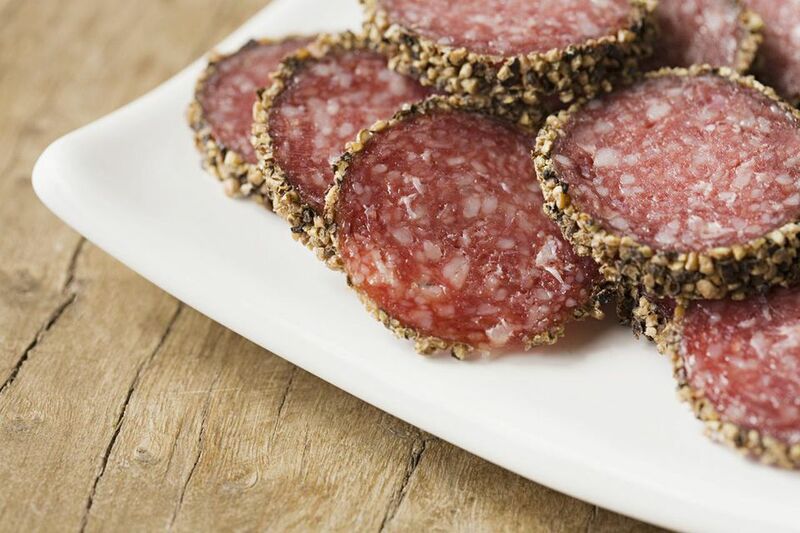 Like anyone who loves pepperoni pizza or the flavorful taste of pepperoni in their salads or sandwiches, you may be curious about how this sausage is made. Firstly, pepperoni sausage is made with either pork or beef. Moreover, it needs to hang to cure for at least six weeks, so this food is not something you can simply whip up at the last minute. It requires that you plan ahead, but the end result is so worth it! You'll not only have delicious pepperoni, but, as a homemade sausage maker, you'll also have a cooking skill that's a mystery to most people. This recipe appears Home Sausage Making by Charles G. Reavis (Storey Books), reprinted with permission. Grind the pork and beef through the coarse disk separately. Mix the meats together with the salt, sugar, cayenne, pepper, paprika, anise seed, garlic, red wine, ascorbic acid, and saltpeter. Spread the mixture out in a large pan, cover loosely with waxed paper, and cure in the refrigerator for 24 hours. The pepperoni is hung by a string tied to the center of each pair. Hang the pepperoni to dry for six to eight weeks. Once dried, the pepperoni will keep, wrapped, in the refrigerator for several months. Rinse the casing under cool running water to remove any salt stuck to it. Place it in a bowl of cool water, and let it soak for about 30 minutes. Wait for the casing to soak. After soaking, rinse the casing under cool running water. Slip one end of the casing over the faucet nozzle. Hold the casing firmly on the nozzle, and then turn on the cold water, gently at first, and then more forcefully. This will flush out any salt in the casing and pinpoint any breaks. Should you find a break, simply snip out a small section of the casing. Place the casing in a bowl of water, and add a splash of white vinegar. A tablespoon of vinegar per cup of water is sufficient. The vinegar softens the casing and makes it more transparent, which makes your sausage look nicer. Leave the casing in the water-vinegar solution until you are ready to use. Rinse it well and drain before stuffing. Pepperoni comes in different sizes, the most common being about an inch in diameter. Some commercial packers offer "pizza pepperoni," which is roughly twice the diameter of regular pepperoni and isn't as dry. This variety can better withstand the high temperature of a baking pizza. If you plan to use your pepperoni primarily as a pizza topping, you might want to experiment with the drying time for best results. If you're handling sausage, you should take steps to prevent contracting trichinosis. Several cases of the illness are reported in the United States annually. It is caused by a parasitic roundworm, Trichinella spiralis, or trichina. The worm, found in some pork and bear meat, can be transmitted to humans if the meat is eaten raw or untreated. Trichinae mature in a person's intestines and are usually killed by the body's defenses. Some, however, can survive in the form of cysts in various muscles for years. Trichinosis need not be a problem for the home sausage maker. In the case of fresh pork not used for sausage, the meat need only be cooked to an internal temperature of 137 F. Pork to be consumed raw, as in dried sausage, can be made completely safe and free of trichinae by freezing it to -200 F for six to 12 days at -100 degrees F (or for 10 to 20 days at 5 degrees F for 20 to 30 days). A precise freezer thermometer is necessary when preparing pork for dried sausage. And remember never to taste raw pork or sample sausage if it contains raw pork.